It is nearly 40 years since we first met Violet, Judy, Doralee and their misogynistic boss Franklin Hart Jr in the classic film 9 to 5. Times may have changed but this story of three women turning on the patriarchy sadly remains just as relevant in this age of the #MeToo movement. One of the film’s creators, Patricia Resnick adapted this modern fairytale into a musical for Broadway 11 years ago, with new songs by the original Doralee, Dolly Parton, to complement her title song. 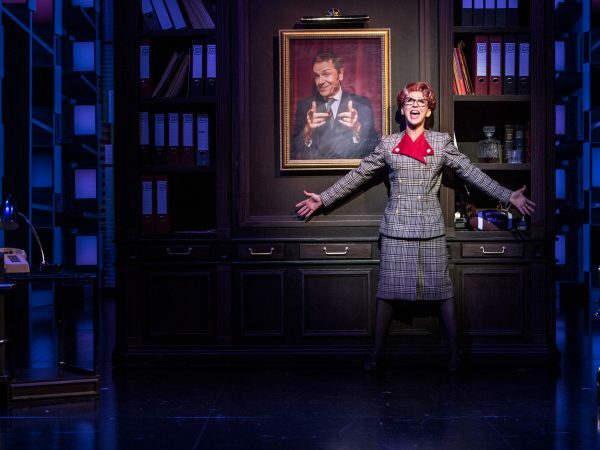 On Broadway the show starred Allison Janney, Stephanie J Block and Megan Hilty, this was a solid adaptation (you can listen to the cast recording to get a feel) but here in London there have been some changes in this UK production. Updated and reworked with a stunning, colourful new design by Tom Rogers and choreography from Lisa Stevens under director Jeff Calhoun, it has been given a rejuvenating boost that injects more of the laugh-out-loud comedy and energy that it originally needed. I think they have made good decisions for this production at The Savoy Theatre, numbers that have been cut are not missed and it allows more dialogue and humour. The set is sparkly, bright and eye catching with 80s style computers being used in the show as TV screens (look out for Dolly Parton herself).The screens change from blocks of colours; the drab and grey start to the show while Franklin is in charge whilst the screens change to bright colours to show the success of the ladies mission and how peace and tranquillity has now hit the office where everybody wants to work, even me! The new UK production benefits from a flawless cast. 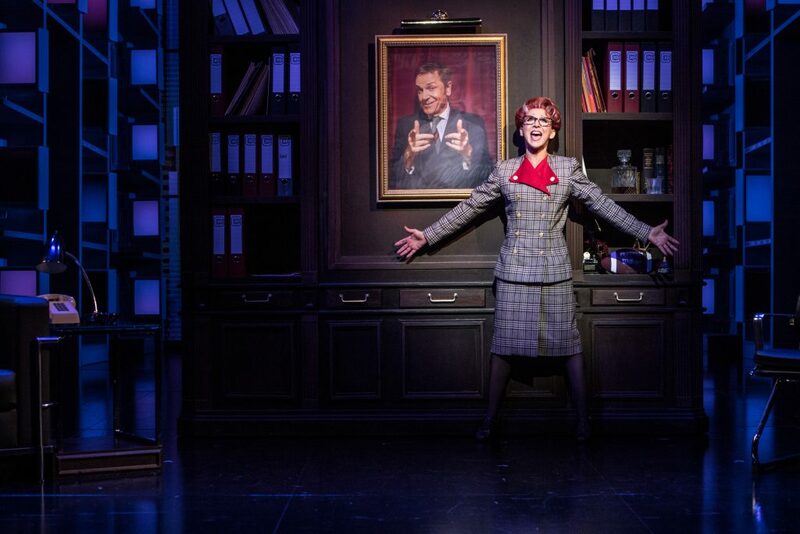 (Stepping in until late March for the injured Louise Redknapp) Caroline Sheen is highly impressive as Violet Newstead, smart, capable and constantly passed over for promotion, Caroline brings real joy to the role as we see her character go from “not a hugger” to a Fosse Jazz dancing CEO! Natalie McQueen shines as Dolly Parton’s alter ego, Doralee Rhodes, funny and forthright – most notably with the catchy country song Backwards Barbie, here she brought depth to the character and really emphasised the wonderful lyrics which really touched me. Amber Davies puts all memories of her time on reality show Love Island behind her with a charming performance as naive Judy Bernly, whose entry into the world of work catapults her into finding her identity. As the show goes on she learns she doesn’t need a man and she is a strong independent woman. I was impressed by Amber as I have to admit when I saw “star of Love Island” I was a little worried! But in the number “I Just Might” as she fights the Xerox machine, she gave a phenomenal, emotional and vocally great performance. Amber also stands out in Act II with the powerful number “Get Out and Stay Out”. 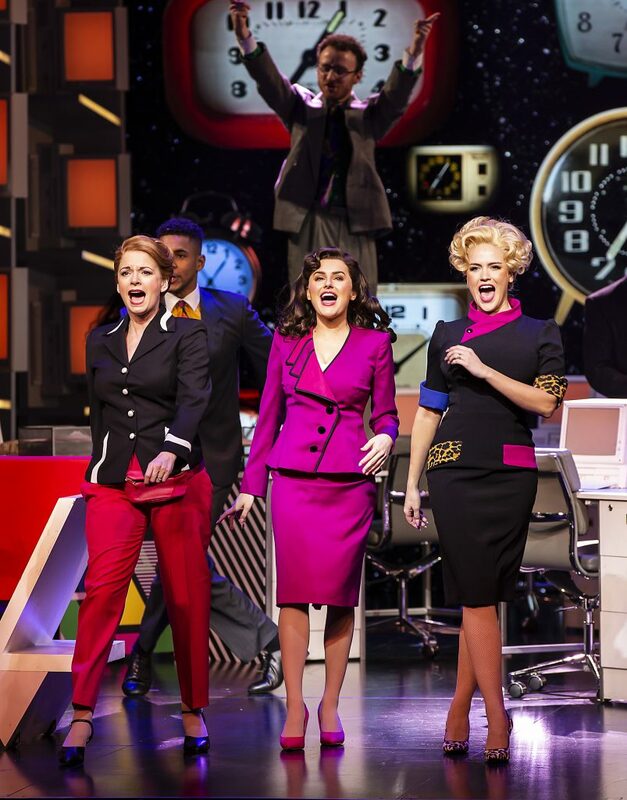 In the show the three fierce female characters come together to take drastic measures when they find themselves all in the same boat having enough with the company’s sexist, sleazy CEO, Franklin Hart Jnr, played with comic bravura by Brian Conley. I had lots of laughs watching Brian and it looked like he was having a blast too! He managed to play Franklin with the right amount of unsavoury seediness and still have you laughing and what can I say about those legs! The show is repeatedly stolen by Bonnie Langford as Hart’s obsequious admin assistant Roz Keith who is hilarious in her devotion and unrequited passion for her boss, particularly in her high-kicking number, “Heart To Hart” . . . you may never see Bonnie in the same way again! Compared to the all-time hit 9 to 5, the songs have some pleasing melodies and you do end up coming away singing a few. 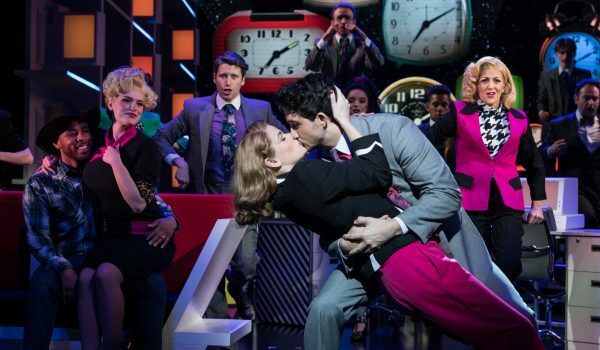 The songs have arrangements by Stephen Oremus, Alex Lacamoire and Mark Crossland and they are given the best possible staging thanks to Stevens’ energetic and playful choreography and Calhoun’s tight direction which mean the show never flags. 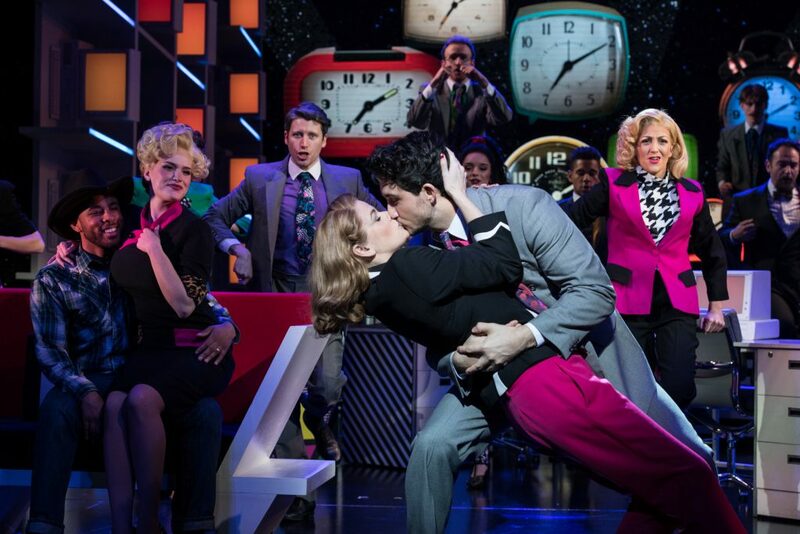 Still set around 1980 but with knowing nods to 2019, the musical is full of crowd-pleasing messages about female empowerment and fighting toxic masculinity. Its feminist principles may feel a little dated, not least in Violet’s kick-arse big number: “One of the Boys”, where she dons a suit and tie in her dream of being accepted into the male world of senior management. Caroline Sheen was sublime in this number and made me forget about Alison Janney ever playing the role. 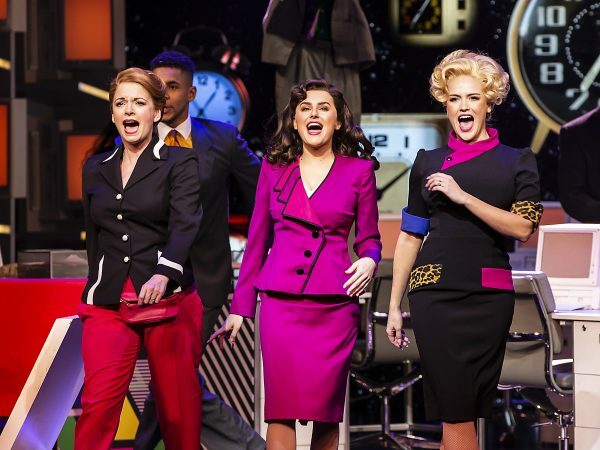 Ultimately 9 to 5 is a joyful, feel-good show that brought the predominantly female audience to its feet for a rapturous, well deserved standing ovation. 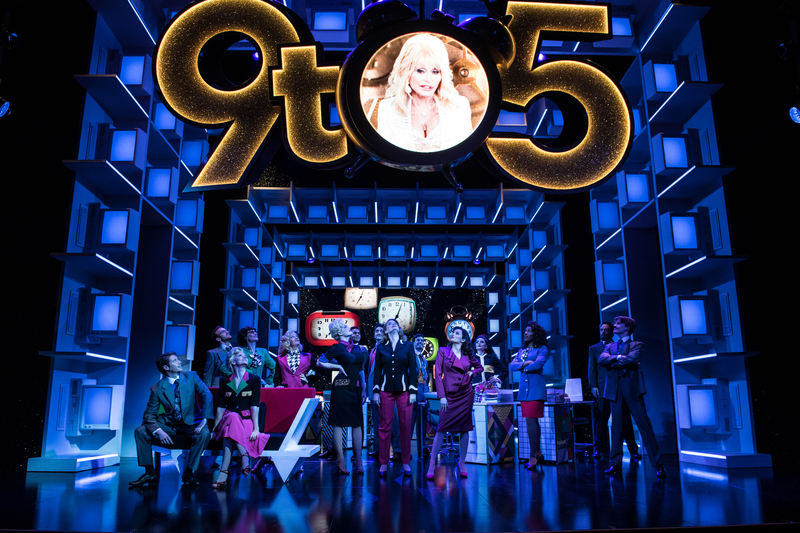 The show is on at The Savoy Theatre till August and will also be heading out on tour, so finish your 9 to 5 and get a ticket now! Too book either see online or call the Box Office on 0844 871 7687.